While fireworks are widely enjoyed by the general public on holidays like the Fourth of July and at other times, these items are capable of causing significant harm and damage if not properly handled and is usually illegal to possess or sell these items for those who are not authorized. The restrictions surrounding fireworks in Los Angeles can be complicated and one can easily find themselves charged with illegal fireworks. In California, the law makes the distinction between “dangerous fireworks” that are always illegal to sell or possess without a special display license and “safe and sane” fireworks which can only be lawfully purchased from a licensed retailer from noon on June 28 to noon on July 6. In many cases, local ordinances may prohibit the use, possession or sale of any type of firework. California Health and Safety Code Section 12505 HSC lists what qualifies as dangerous fireworks. These fireworks are always considered illegal unless the individual has a special display license that is usually only issued to trained pyrotechnic operators who are engaged in officially sanctioned firework displays. Dangerous fireworks include those that contain arsenic sulfide, arsenites, chlorates, magnesiam, phosphorous, zirconium and other dangerous or combustible chemicals. 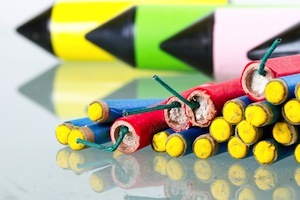 It also includes firecrackers, skyrockets, and sparklers that are over ten inches long or thicker than ¼ inch in diameter. There are certain exemptions provided for those who use these products in connection with industrial, commercial or agricultural uses or religious ceremonies and who have proper permits. Any fireworks that would not be classified as “dangerous” would be considered “safe and sane.” However, under California Health and Safety Code Section 12599 HSC, safe and sane fireworks can only be sold at a fixed business by a licensed seller between noon on June 28 and noon on July 6 every year. The only exceptions are party poppers and snap caps which can be sold throughout the year and do not need to be purchased from a licensed retailer. There are a number of ways that a person can violate fireworks laws, including advertising fireworks without being licensed to sell them, illegally storing fireworks and even using a flare gun in an improper manner. However, the most common fireworks offenses involve the illegal use, possession and sale of fireworks. It is always illegal to possess dangerous fireworks. Possessing safe and sane fireworks is usually acceptable, however it is important to remember that a person who injures another person or creates a fire hazard as a result of improper firework use can be charged with other criminal offenses such as battery in violation of California Penal Code Section 242 PC or arson under California Penal Code Section 452 PC. It is also illegal to sell fireworks without the proper license to do so. In addition, furnishing dangerous fireworks to a minor is also a criminal offense under California Health and Safety Code Section 12702 HSC that can result in the defendant being charged with a felony offense. There are a number of defenses that may apply to those who have been charged with fireworks offenses. In many cases, an officer may have falsely identified the person responsible for setting off an illegal firework due to fact that these offenses tend to occur in large gatherings of people where it may be difficult to identify the perpetrator. Most fireworks offenses are misdemeanor level crimes. Those who are convicted can be sentenced to serve up to a year in jail and up to a $1,000 fine. The defendant would also have the fireworks seized and may be required to take a fire safety course. When the defendant is charged with possessing over 100 pounds of dangerous fireworks, he or she can be charged with either a felony or a misdemeanor. If charged with a felony, the defendant can be fined up to $50,000 and may be sentenced to serve up to three years in prison. If you or a loved one have been charged with a fireworks offense, it is critical that you consult with a Los Angeles Criminal Defense Lawyer as soon as possible. As a former Deputy District Attorney with over 14 years of prosecutorial experience, Los Angeles Criminal Defense Attorney Michael Kraut understands how to effectively defend those who have been charged with illegally possessing, selling or manufacturing fireworks. For more information about Los Angeles fireworks offenses, contact Los Angeles Criminal Defense Attorney Michael Kraut at the Kraut Law Group located at 6255 Sunset Boulevard, Suite 1480, Los Angeles, CA 90028. Mr. Kraut can be reached 24/7 at 888-334-6344 or 323-464-6453.